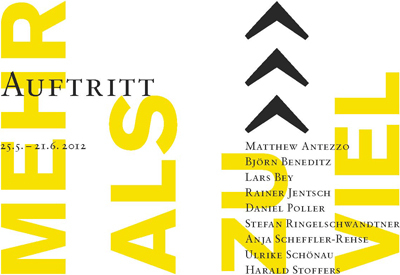 The Mehr als zu viel ( Mazv, More than too much ) project is launching in Berlin with the Auftritt ( Entrance ) exhibition. The project’s aim is to create new forms of artistic production, communication and presentation for people with and without disabilities in Hamburg and Berlin. June 21, 2012, 6 p.m.
Art as a means of expression and production can reflect the full range of existing diversities, idiosyncrasies, cultures and talents. It summons the spectator to take notice or even to participate. Art is not seen as a panacea, or as a social bonding factor, but rather as an invitation to aesthetically reflect upon or confront particular conditions, habitual perspectives and the co-existence of disparities. Founded in 2010, Mazv brings together artists and mediators from many walks of life who originally met at the Hamburg Galerie der Villa . The Galerie der Villa is a Hamburg studio and exhibition venue where people with and without disabilities can work and cooperate. This extremely successful project has now expanded to Berlin, where it aims to get established with an open and ongoing series of exhibitions, projects and events. It will provide possibilities for art production to people who have perhaps been perceived as “different” or “special” within the contemporary art scene.